May 09, 2016, 3:38 p.m.
A comparison of two YouGov polls for Good Morning Britain, one at the start of April and one this past weekend, show that in the past few weeks Boris Johnson&apos;s trust on the issue of the EU has fallen by six percentage points, from 36% to 30%. He is still ahead of the next most trusted politician on the matter, Jeremy Corbyn, however the gap between them has narrowed from 6% to 4%. David Cameron&apos;s score remains unchanged at 23%. To put this in perspective, we added some other leaders including US President Barack Obama to the list and measured their NET score on trust (ie the percentage who trust them minus the percentage who don&apos;t.) Even following his divisive intervention last month, President Obama is the most trusted voice, while Boris Johnson came in second - crucially among swing and uncertain voters. 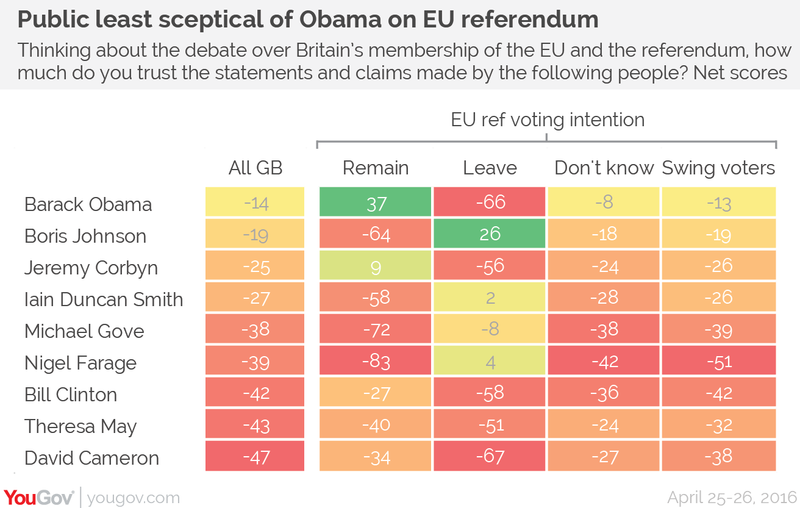 Boris Johnson was easily the most trusted politician among those who want to leave the EU, far ahead of UKIP&apos;s Nigel Farage (+26 in net terms compared to +4), but he will have to do more to win the hearts of those who aren&apos;t already on his side.